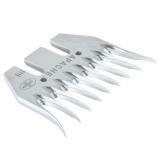 I've used these 9 tooth combs to shear for a few years, they allow for more speed and stay sharp longer. It is important to be careful with these and I don't recommend shearing bucks with them. 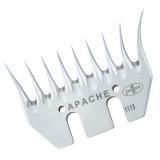 I find that the Apache Searing Comb does the very best job shearing thick Icelandic wool. We had to shear 5 ewes that had been left to run wild (not shorn for 2-3 years, in a field full of burdock and multiflora rose) and this was the only comb we could get through the worst of these fleeces. 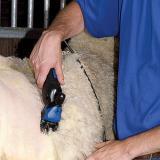 I can totally see how it would give you a lot more speed once you get comfortable with shearing. But watch out when you are just starting out because this comb is quite a bit bigger and sharper than the Phantom R comb we started out with. Good comb if you've got the skill to avoid cutting the sheep. I started out with the Spirit, and have moved up to the Apache and my times have greatly improved. Premier has the best prices out there for cutters and combs. Wonderful for cutting through sheep that produce heavy wool clips. The next best thing to using a heavy duty shearing machine! Through personal experience I would recommend just making sure the cutter doesn't extend past the bevel on the comb particulary for the Apache it's really sharp.